The Garden of the Zodiac is a small tucked away gallery in the Passageway known for bringing its owners European sensibilities to the Old Market. The gallery is currently hosting Italian painter Paolo Dolzan, who has shown in the space before (2010, 2013). The artists had spent the two weeks prior to the opening constructing this exhibition, painting at least one painting a day. The result? A macabre sketchbook of dark landscapes, scratchy still lifes, space-less places, and disfigured heads – all of which are as mythological as they are drastic. With their quick aggressive gestures, Dolzan’s acrylic paintings and charcoal drawings consume the gallery with the grim physiological content of dark humanism. Entering the gallery, immediately to the right are three skeletal charcoal drawings of heads. With a helter-skelter approach to drawing, these moody (and spooky) smears are as provocative as evocative. Huge swaths of ebony create voids on the paper dotted with the artist’s fingerprints, sweat, and erasure crumbs forming just enough contour for a rough face to emerge. As viewers, we instantly get a glimpse into Dolzan’s process and studies. Perpendicular to the heads is “Montagna Rossa con carcassa” (Red mountain with carcass). This very large painting builds on the principles and mark-making tendencies of the heads while extending into a color field of mystery. Filled with a spectrum ranging from cerulean blue to mauve to ochre to blood red, the gloomy landscape is never fully exposed as either a physical or internal terrain. Possibly depicting Mount Vesuvius or maybe the elephant graveyards in Disney’s The Lion King, bones are stacked in front of the red mountain-scape with a storm brewing in the distance. The painting weighs heavy with emotional and physical potency. It’s hard not to connect a few dots with the painted sky and the artist’s sensitive content. 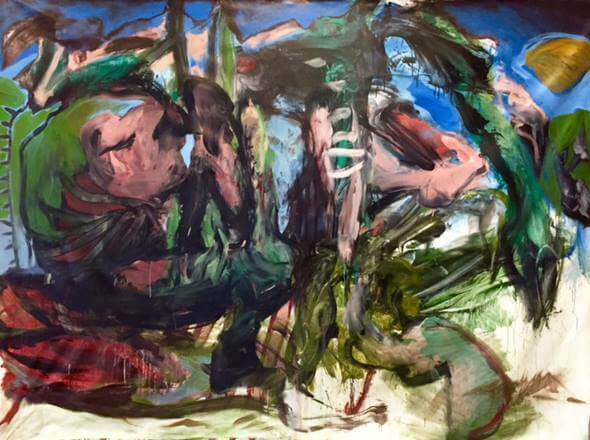 Locations change as Dolzan renders what appears to be a crocodile peaking its toothy jaw out of a Joan Mitchell-esque swamp. In abrupt contrast to the previous painting, “Giungla” (Jungle) is tamed with soft lavender and sea foam green tones. This painting is concise in concept, while allowing the artists loose and hurried brush stokes to fill the canvas. Extending this approach, Dolzan has an ability to demarcate space without using perspective. This is most obvious in “Il giarindo” (The garden) where space is flattened and expanded on a large engulfing canvas. Micro and macro views unfold within the painting using Dolzan’s now obvious macabre techniques. With the actual Garden of the Zodiac beamingly on view through the next window, this painting and its associated ephemera, is overwhelming. There is no reason to get too close, as the painting is aggressive and ready to punch you in the face. Who knew a landscape painting could be this assertive? Like the other larger works, the presence of the artist is also on view. Dolzan is ringside ready for a knockout. No moody exhibition is complete without a dense still life. In “Natura morta” (Still life), Dolzan filters a still life (presumably one of artist Vera Mercer’s velvety still life photographs) through his muddied brush strokes. This image is filled with culinary oddities and known tropes of the genre. Dolzan articulates his depth and ability to articulate physical, mental, and conceptual space with impactful expressions. When thinking about this exhibition as the artist’s Omaha sketchbook, there are, of course, going to be a few pages that fall short to the masterworks. Number 14, “Uomo, Albero, Capra” (Man, Tree, Goat) is one such work. The painting is a heavy-handed gesture filled with obvious forms and banal color choices. It is a large canvas that is largely unsuccessful in content – featuring a sinister goat and shepherd toking away the afternoon under a drippy tree. This one-note painting also lacks Dolzan’s keen depiction of space boring viewers with superficial incongruent brush strokes. Unlike the jungle or mountain-scape, the marks are hurried in manner that come off as elementary not elemental. The rest of the exhibition unfolds as a grab bag of horrifying scarecrows, a cute kitty, several emaciated cattle, a tired (self?) portrait, more charcoal exaggerated heads, and an out of place sculpture; all with the rich color, quick marks and dark demeanor storming through the rest of the gallery. With his shadowy wink, Dolzan complicates “Nebraska Nice” forcing an aggressive outsider’s perspective onto our idyllic #HuskerNation culture. This is no happenstance observation. The artist is a studied professor not shy of sharing a polemic comment under his cool Italian accent. While the contextual work is deep and twisted, the exhibition is, according to curator Fulvio de Pellegrin, “an immense psychological leap into the depths of impressionism.” A leap it is. The full exhibition is exhaustive. An intense CrossFit approach to art making. Like any workout, there are moments of fatigue, success, and those tiny flashes when you cheat yourself hoping no one will notice. Similarly, there is a seemingly impossible time limit to this workout (exhibition): as many reps (artworks) as possible in two weeks. Paolo Dolzan: mind escape is on view through October 31 at the Moving Gallery at the Garden of the Zodiac located in the Old Market Passageway at 1042 Howard Street, Omaha.